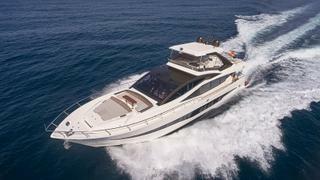 Spanish yard Astondoa has launched the latest model in its 80GLX range, which has been named 17. Currently on display at the 2017 Cannes Yachting Festival and due for delivery to Miami later this year, this new 24.9 metre flybridge yacht varies from previous hulls in the series as she has larger windows and a completely open-plan saloon with no steps between the galley and the lounge. 17 was built to Germanischer Lloyd standards from a GRP hull and superstructure. Her vital statistics include a maximum draught of just two metres. 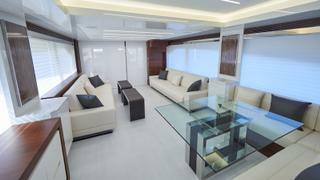 Accommodation is for up to eight guests split between four cabins, all of which are situated below deck. 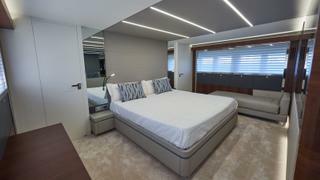 The master cabin stretches across the entire six metre beam, while the two further double cabins are situated in the bow and on the portside. 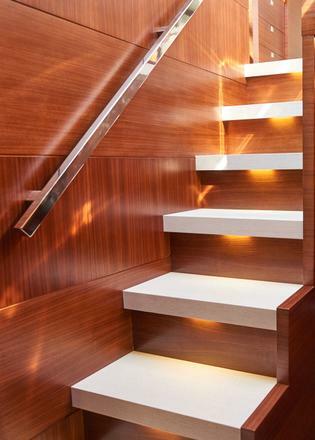 A twin cabin to starboard completes the layout of this area. Al fresco relaxation options are plentiful with a split foredeck seating area and built-in bench seating on the aft deck — ideal for dining al fresco. However, the star of the show is undoubtedly the flybridge, with its bar area, built-in sunloungers and a second dining area, which benefits from the shelter of a louvred bimini. Power comes from a pair of MAN 12V diesel engines, which allow for comfortable cruising at 28 knots, topping out at 31 knots. Meanwhile her 6,300 litre fuel capacity translates into a maximum range of 400 nautical miles. Other superyacht projects currently under development at the Spanish yard include the 100 Century yacht Ninitas, which is also on display at this year's Cannes show.